Restaurants often debut with what insiders term a "soft opening"—no official announcement. The hope is that word of mouth will spread slowly, thereby allowing the chef and servers to get their act together. The Shoreham Restaurant and Bar in the revamped Shoreham Hotel, however, seems to have pioneered an entirely new kind of business launch: the invisible opening. Five times, I phoned to make a reservation. Five times, I was transferred to a person asking, "Room service?" (Someone at the hotel's front desk eventually took my name.) When I did show up, I wandered the hotel's hallways trying to find the dining room. There's no visible sign—inside or out—no hostess table and no maitre 'd stand. 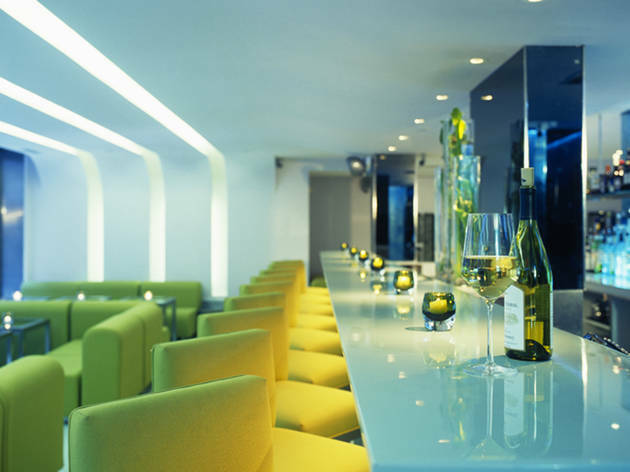 Finally, I was told that the restaurant is actually the bar: nine stools, plus a series of low-slung glass tables better suited for cocktails than chowing. Yet even as a mere bar, it comes up short. There are only 22 bottles on the wine list, and the bartender informed me that he was out of Midori, a common melon liqueur and an essential ingredient in the Shoreham's signature drink, the unfortunately named "I Shoreham Happy" martini. I sure am baffled. None of these glitches would be especially noteworthy if the Shoreham weren't a midtown Manhattan hotel with a serious track record, a new noteworthy chef and an 18-month, multimillion-dollar renovation. The hotel, which dates back to 1927, previously hosted La Caravelle, one of the great French restaurants of the 20th century (it closed 18 months ago). 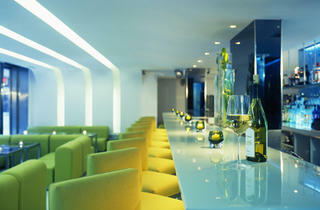 The restaurant now has a cool, New Age look, heavy on sloping walls and ceilings, candles and glass. Consulting chef Tim Reardon, who trained at Daniel and works as chef de cuisine at Nice Matin, conceived an ambitious multicultural menu that's far more polished than its surroundings. A winter-friendly pumpkin-curry bisque had the autumn richness and spice of a liquid pumpkin pie. Reardon's Asian salad of radish sprouts, enoki mushrooms and rice noodles wrapped in rice paper scores points for creativity, but ultimately tasted blander than it sounds. His appetizers favor fish and veggies—and are occasionally oversold. "Gratin of lobster" is, in reality, macaroni and cheese (technically, cavatappi pasta and smoked cheddar) with just a few strips of lobster, but it's satisfying nonetheless; the thyme bread crumbs lend a nice textural contrast to the mushiness. Similarly, the "truffled" goat-cheese ravioli comes with a delicious leek cream sauce, though I detected only the faintest hint of perfumed fungi. Main courses run around $23—not excessive for the neighborhood but absurd given the environment—and dabble with the surf-and-turf genre. Reardon's large $22 kobe-beef burger exemplifies why a "kobe" designation doesn't seem to mean much anymore (I prefer the $6 burger at the nearby Parker Meridien's Burger Joint), but the lightly battered, tempura-style onion rings, linguini-thin and crunchy, were outstanding. A quarter roasted organic chicken, sitting on the biggest potato croquette I've ever seen, proved equally filling, which is essential given the oddest part of the meal: There's no dessert—yet. If you call room service, however, they'll happily direct you to a diner around the corner.